I love my Google Reader shares, as can be seen on our family news page. I particularly appreciate being able to "star" and "share" items using Google Reader Mobile. Of course there's always room for improvement. Google lets me tag blogs and share by tag ("folder"), but I can't sum blogs and I can't filter, for example, all my shared items save those that belong to the tag "politics". The politics is the problem. I am, shall we say, not enthused with the GOP. Now it is true that all my friends feel pretty much the same way, but that is not true of my colleagues. If I give them my Google shared items feed address they'll find it a mixed blessing. That's where Yahoo Pipes come in. Yahoo Pipes can be used to filter out, say, iPhone posts. Pipe are cool, even Googlers like 'em. 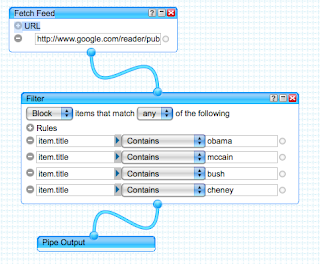 I was hoping I could create a Pipe of form [All A not in B] where A is my Google Reader shared item feed and B is my Google Reader politics feed, but I don't think that's supported. On other hand I can filter out posts containing Cheney, Bush, McCain, Palin and even Obama. That's not optimal of course. It will eliminate many news stories, and some horticulture. I'll see what else I can do, but in the meantime I'll test pipes.yahoo.com/jfaughnan/lesspolitics. I've added it to my Google Reader shares, so I suppose I can now create recursive shares ..
Update 2/2/09: I find a fix from a different angle.